Key Difference: iPad and iPad Air came with many similarities and iPad Air was a slight upgrade to the iPad. Apple successfully entered the tablet market with its iPad way back in 2010, marking a whole new generation of Apple products and setting new guidelines for tablet makers everywhere. Before we start this comparison, please note that iPad made it to the 4th generation before it was discontinued and replaced by the newest iPad Air. The iPad being discussed in this article is the iPad 4 or iPad 4th generation and iPad Air or iPad 5 (informally named). 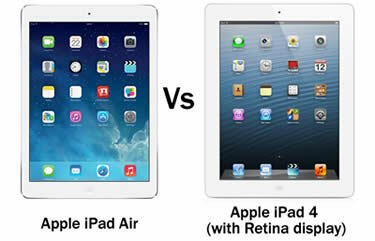 iPad and iPad Air came with many similarities and iPad Air was a slight upgrade to the iPad. Both tablets come with two models (Wi-Fi and Wi-Fi + Cellular) and internal storage capacities (16/32/64/128 GB), that determine the prices of the tablet. 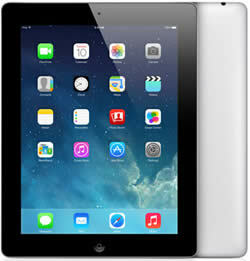 The iPad Air was announced a year after the announcement of the iPad 4. Let’s get on to pointing out the similarities and differences between the two. Both the tablets come with a similar design and offer the same display a 9.7 inch IPS LCD with the company’s innovative ‘Retina’ technology and offer the same 264 ppi resolution. Both the screens come protected with scratch-resistance glass and oleophobic coating. Although both screens are 9.7 in size, the major difference in terms of looks lie in the bezel surrounding the screen. While, iPad was a bit more bulky, iPad Air is thinner and has slightly smaller dimensions. The company accomplished this by reducing the bezel size around the iPad Air screen, making the iPad Air screen look bigger in comparison and the device lighter than its counterpart (shaving almost half a pound). The company has also changed up the colors a bit. The iPad was available only in black and white, while iPad Air is offered in two slightly different shades. It can either come with a white front and a silver back or a black front and a gray back that Apple refers to as "Space Gray." Both the devices come with the same megapixels in the from iSight camera as well as the rear snapper. The 5MP rear camera is enough to snap pictures, but not the same as the cameras offered on the iPhone models. The 1.2MP front camera is enough for video call via FaceTime. However, according to iLounge, both cameras have a slightly smaller lens compared to the ones mounted on the iPad, resulting in slightly different colors and lighting on the photos, mostly unnoticeable unless in side by side comparison. Both the devices offer HD video recording via the rear camera. Although initially launched with different operating systems, the iPad (originally launched with iOS 6) and iPad Air (originally launched with iOS 7) are both upgradeable to iOS 8. The iPad comes with the Apple A6X chipset and a 32-bit architecture, while the iPad Air comes with the Apple A7X chipset and a 64-bit architecture, which the company touts makes the system of the iPad Air run faster and more smoothly. Both offer 1.4 GHz dual core processor, but the iPad Air also has a M7 coprocessor, which is designed to collect data directly from the sensors, to take the extra load off the primary processor and improve power efficiency. The iPad comes with a non-removable Li-Po 11560 mAh battery, while the iPad Air comes with a non-removable Li-Po 8600 mAh battery. However, both the devices offer the same juice, around 10 hours of battery power.